Tuesday's Think Kit prompt - "Scents have the power to take us all kinds of places. What smell takes you somewhere else? Where'd you go?" Smells are important. Especially the smell of blueberry muffins on Christmas morning that wafted through my home growing up. It's a rather innocuous smell but one that's really left an imprint on me. This smell is so engrained in my being. Mom somehow finds time to make a couple dozen boxed blueberry muffins to take to Grandma and Grandpa's house for Ford Christmas, all while doing the things great moms do on Christmas morning. This took decades of conditioning and because of that, whenever I smell blueberry muffins I'm no longer completely here. I'm partially there. I'll be blogging from my phone, more times than not this Think Kit. Please excuse typos or editing lapses because this screen is apparently still too small for those sorts of things. Friday's Think Kit prompts, "What new circles have you formed?.... Explore your kumbaya moment from 2015." This past year, there was a social circle of mine that evolved into something lasting and memorable - Park Ave Neighbor Night. It's turned into a real kumbaya experience that's enabled me to meet some really great people. I can't take credit for neighbor night. It's the idea and initial dedication by our neighbors the Moseys. As with most ideas, it takes some dedication to build momentum and I'm thankful for them as what we have now is pretty great. 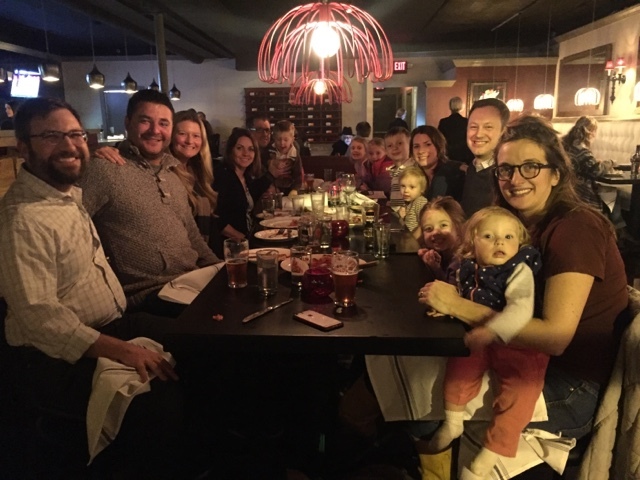 On nearly a weekly basis this past year, four families on our block of Park Ave. would simply meet at someone's house for dinner on a weeknight for dinner and drinks, nothing more, nothing less. We'll all pitch in and contribute to the cause. We've got some talented cooks in the group, so what we eat is really delicious. More so, we've got conversation and camaraderie. It's been really great. It's a multigenerational circle as our kids are friends get shuffled to one side of the yard or to the play room. I have a tendency to be hermit at home and not find the energy to be a good neighbor. So, I'm really thankful for this group of people and our hyper local communal circle. Layer in the strong little pocket community of restaurants and commerce present in the mid-town area (49th-54th and College Ave.) and what we have is a vibrant, local community. I love my hood and have neighbor night, in large part, to thank for it. I believe 2015 will be marked in the history of the Ford family as the point in time where we doubled down on our commitment to Indianapolis. We made a strategic move with the purchase of a house up the street. Moving five houses up to this property will enable us to dabble with that we just couldn't experiment with in the old house. We will watch this city grow from this new house and from here, will play our part to make it a great place. We found this house on a different corner of the same block on which we are currently living, so we are really setting ourselves up to be the old-school family living on this particular block for decades. We do love the old house and had many, many good time there. We lived there for 12 years and saw three children born there. The memories and connection to the old house is undeniable. The house that we've just moved into, as of 12/31, has more bedrooms, more entertaining space, and a much larger backyard. Living in this house allows us to continue living in the city and in the south east corner of Meridian-Kessler while respecting the fact that we have three children who need to get out and have some space to play. As a farmboy I can appreciate having a little bit extra breathing room, but I am essentially a city slicker now so this house in this property or a good compromise. Later this month, I'll be posting on the rehab work on this old house we facilitated. Wow, how things changed between us closing and move in. It's exciting! TL;DR -- The thirty thousand foot view story of 2015 is that we bought an old house on a big lot that we'll be using as our vantage point to experience Indianapolis for the next couple of decades. Think Kit is back and it is welcomed! Let's jump right in. If I were writing this current volume of my autobiography, the first line summarizing my glamorous life would read something like this, "I'm not sure how much of my life is grounded in reality these days." Sure my day job, some aspects of parenthood, and paying bills keep me grounded but beyond that, my head is elsewhere. The prologue would suggest that perhaps it's some sort of halo affect from being around a couple of really imaginative kids. Maybe their unadulterated imaginations and dreams create some sort of wake that I'm subconsciously riding. Whatever it is, I truly enjoy it. The opening summary of this autobiographic volume would also mention the media I consume, particularly what I read and my music. I've recoiled at the tone, presentation, and general content of the non-fiction I typically read (news, political analysis, etc.). This leaves me with fiction. As a reader, you know how easy it is for the medium to transport you from where you're currently sitting. Additionally, the music I predominantly listened to in 2015 sends me miles away. It's a random combination of genres that feels like a mix between NPR's Hearts of Space and Indy's 91.9 on the fm. All of it creates a contemplative state. I welcome this shift away from reality. It feels like a spiritual Renaissance, of sorts. After years of preoccupation in practical matters, things have balanced back out and can be summed up by my opening quote mentioned above. I do enjoy the way my story is shaping up. Day 9 and we're still in the "It's going to look worse before it looks better" phase. The power is still on, it's just that there aren't any lights or switches in most of the house. This makes minor tasks like marking the ceiling for lighting and measuring for dining room tables after you've eaten dinner feel like you're on the set of your very own Blair Witch Project. Ok, so we bought a new 100 year old home. The second such 100 year old home we currently own, on the same block (let me know if you know anyone wants to be our neighbor on a great street - seriously). There are a number of different, more daring differences between our old home and this new home. Where our old home was a finished embodiment of vintage and modern residential real estate glory, this new home hasn't seen an update in 30 years. It's got beautiful bones but needs a skin graft and a couple of organ transplants. So, we thought to use Fridays With The Fords to chronicle our adventures and misfortunes making this new house ours. One, not so uncommon scenario in our neighborhood, is the 100 year old wiring that comes with the 100 year old house. 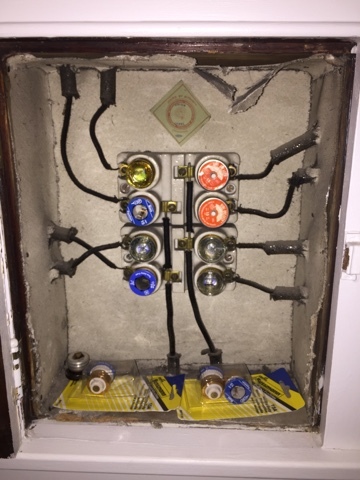 It's unsettling that we get such a variety of answers from electricians as to the safety and reliability of knob and tube wiring. We're biting the bullet and rewiring the the whole house, knowing it would easier to address this while it's still empty and adopting the layman's perspective that it's weird to envision wiring from that day and age powering life in the 21st century. No offense to my people who made the decision to let sleeping dogs lie and not address knob and tube in their home - I get why you may have don this. This is a pricey affair but worth it if you can swing it. 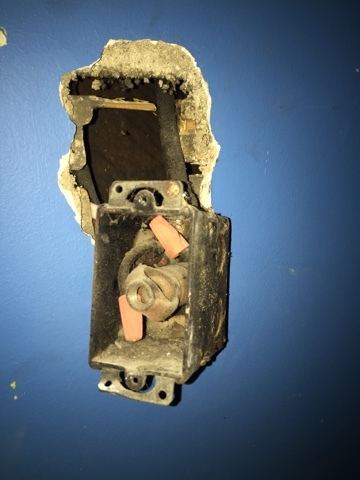 Take a look at what the electricians are replacing.